Certification to the EN 54-10 standard of the European CPD assures General Monitors’ customers that the FL4000H flame detector has undergone rigorous testing and been determined to meet the highest quality standards. The risk assessment-based EN 54-10 certification process was built upon scientific research and is recognized by European regulators, insurers, and major clients. Certification to EN 54-10 means that the FL4000H is eligible for use in countries that conform to European safety standards. 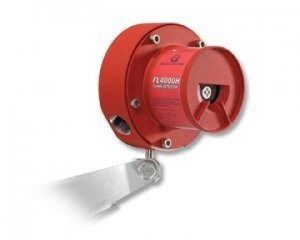 Featuring a next-generation MSIR sensor that incorporates neural network technology (NNT), the FL4000H provides reliable flame monitoring with superior false alarm immunity, a wide field of view (FOV), and one of the industry’s longest detection ranges. The flame detector’s detection algorithm is based on artificial neural networks (ANN), which are mathematical models that correlate certain patterns of infrared radiation with the incidence of flame. The optical IR sensor array and the neural network function together as an adaptive and intuitive decision-making mechanism, resulting in one of the industry’s most reliable schemes for discrimination between actual flames and costly false alarm sources. Because of its accurate and reliable flame detection, the FL4000H sets a high standard for performance, reliability, ease of use, and value. It gives process and plant engineers a powerful new tool for protecting people, equipment, and facilities from dangerous hydrocarbon flames.